Customer Information and Financial Management, Services Provided Setup and Management, Individual and Multiple Horse and Customer Billing Logs, Individual and All Customer Invoicing with Invoice Period Selection and Line Item Management, Automatic Invoice Splits for Multiple Horse Ownership, Customer Account Statements. Customer Invoice Emailing from within equineGenie. You can enter a customer’s contact information. A customer’s picture can be stored in equineGenie. A customer can be removed from the customer active list. If a customer’s history is required the customer can be recalled. Additional customer documents, images, videos and personal information can be stored. A customer’s payment information can be saved and managed. Services and Products provided to the business’s customers can be set up for easy selection when a customer or a customer’s horse is billed. Each time a customer’s horse incurs a charge, an invoice line item is generated on the Horse Billing Log. Multiple horses can be billed for the same service or product on the same date. This saves considerable time if you have the same services or products that that are billed to multiple business's horses on the same date. Each time a customer incurs a charge, an invoice line item is generated on the Customer Billing Log. Multiple customers can be billed for the same service or product on the same date. This saves considerable time if you have the same services or products that that are billed to multiple business's customers on the same date. A customer’s invoicing period can be set. 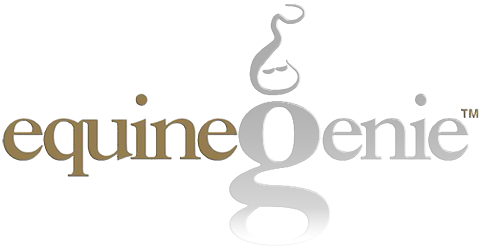 An invoice history and delinquency is tracked and managed by equineGenie. A customer’s invoice is easily generated from their horse and or customer billing log line item entries. An invoice period can be selected to pick up past and forward charges in a specified invoice period. Multiple customers can be invoiced on the same date that have the same invoicing period. equineGenie invoices each customer for their specific line item charges in the identified invoicing period. Invoices can be emailed to a customer from within equineGenie. When the email button is selected, equineGenie converts an invoice to a pdf and emails the invoice to the customer's email address entered in the customer's contact information. A receipt can be generated for a service or product provided to a customer that does not get invoiced.